When I moved into my current studio in an old industrial car factory for Praga cars in Prague some 7 years ago the building was basically empty and the old offices were filled with junk and debris from the former workers there. 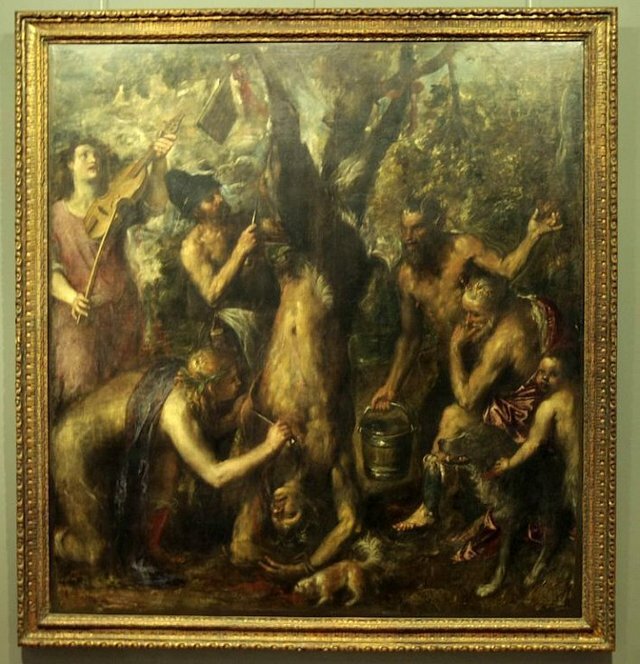 In the chemistry lab I found a poster of The Flaying of Marsyas by Titian. This is one of the most famous paintings in the Czech Republic, housed in the estates of the archbishopry in Kroměřiž in Moravia. I've had it hanging on the door of my studio all this time and finally decided to use it. So I did this work in two days just this last weekend. Its kind of different than my other work. First I did a quick study of the painting, simplified of course, and somewhat distorted. On the second day I finished that and added the bottles. Titian is one of the great masters of painting, the Picasso of his day, as it were. He painted in the 16th century in Venice during the High Renaissance, but in many ways he is a pivotal figure and the first modern painter in the way he worked out his painting directly on the canvas making numerous changes and using many novel techniques. Before Titian artists generally worked on panels and planned everything out in detail before they began working on the final piece. But Titian worked on large scale canvasses and often changed his compositions as he worked which is the birth of the modern approach used by many painters after him up to today. Of his many techniques, sfumato or fog is the most appealing to me in that he would cover the entire canvas with a half transparent wash and then wipe it away in places to add atmospheric effect. Together with impasto or thick application of paint he slowly built up numerous layers until he was pleased with the final results. He lived into his late 70s or 80s, no one is sure of his exact age at death, and his eyesight was poor, so his later works are known for their almost impressionistic effect of blurring and soft edges. Its a very modern feel and the Flaying of Marsyas is considered to be one of his last canvasses. So why bottles? A friend of mine on Instagram said the painting needed a DJ turntable and a mic, he saw the classic mythological scene as a rave, and perhaps I was thinking of a metaphor with the empty bottles that the party's over. 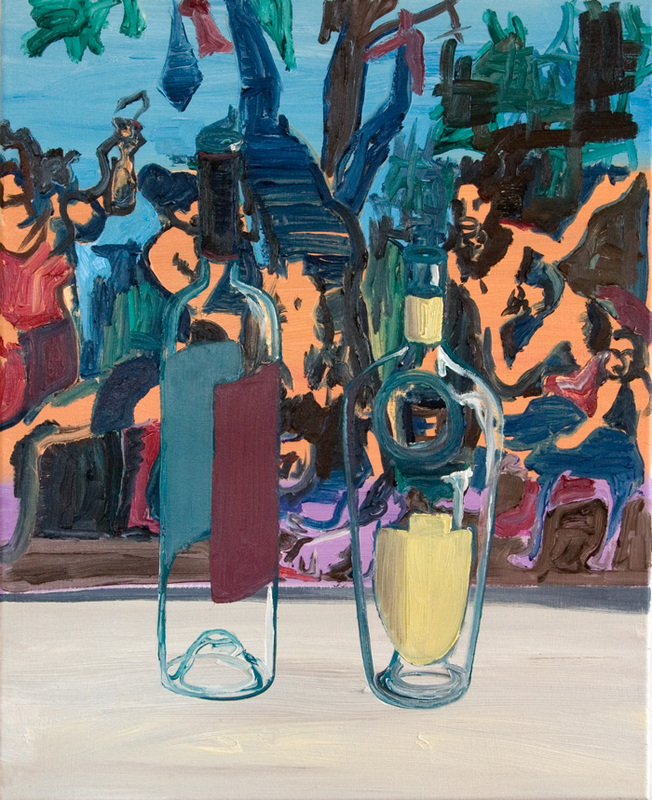 But on another level juxtaposing a classic work with dirty old bottles of cheap wine reflects the common trick of high and low culture brought together. We see this again and again in contemporary art because our society is flooded with trash. We are choking on plastic and I've seen that by 2025 the amount of plastic trash in our biosphere will double. Unbelievable. Paint is just colored dirt suspended in resins and oils, so when used to paint an illusion of material space and objects, the medium lends itself to exploring the contrast between dirt and spirit, between the physical and the metaphysical. That's the whole poetic purview of art, but apart from language, it works on the level of the visual which then, in our questioning minds, asks to be explained. So what do the bottles and the Titian say to you? I'd like to hear your response to the work.